This small carpet, or large rug, from Varamin was made in the early part of the 20th century. 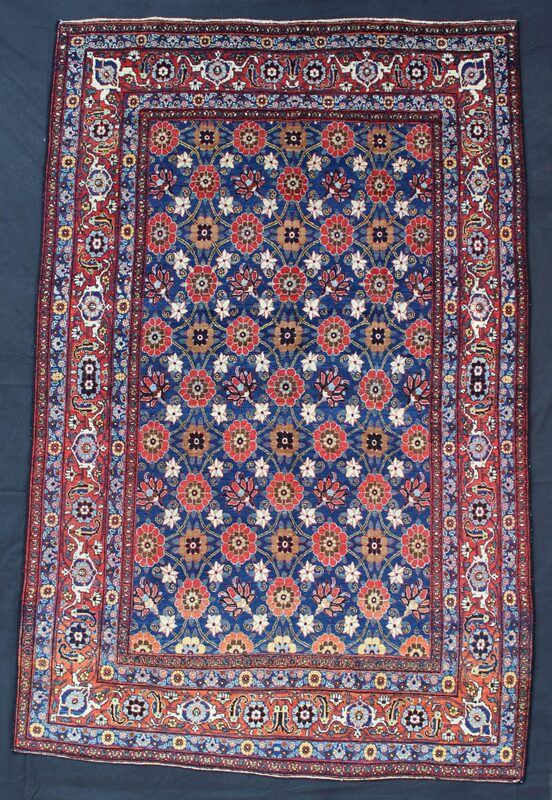 The elegantly drawn Mina Khani design of the field on a blue ground is typical of carpets from this area and age. It is enclosed by a main border with a Herati design on a red ground. The rug has a finely woven wool pile on a cotton foundation and is in perfect condition. An almost identical, but slightly squarer, example of this type is published in Murray L Eiland Jr. & Murray Eiland III, Oriental Rugs. A Complete Guide. London, Laurence King Publishing, 1998, Plate 87, page 119.